Nutritious and versatile, smoothies make an excellent quick snack, and can also count as one portion of the recommended five a day. Serve them at breakfast to provide a treat for the family and a healthy start to the day. There is a huge choice of fresh fruit at this time of year. Place all the ingredients, except the ice cubes, in a blender or food processor and purée until smooth. Add a little extra milk if you prefer a thinner consistency. Add the ice cubes, if using, and blend again for a further 20-30 seconds until the ice is roughly crushed. Serve immediately in long, chilled glasses. Food Explorers is our new range of good food for children aged 5-9 offering meals, snacks and drinks with controlled levels of fat, salt and added sugars. This Food Explorers recipe follows the same guidelines and can help to provide a balanced eating plan for the family to enjoy together. 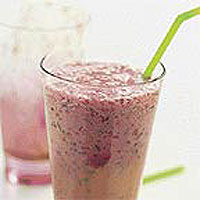 Replace the raspberries and blueberries with other seasonal berries.